EDINBURGH, Scotland, 2018-Jul-16 — /Travel PR News/ — A stunning cornerstone of Falkirk’s history has scored a five-star rating from VisitScotland. Callendar House, which dates back to the 14th century, has achieved the national tourism organisation’s top-quality award. The historic house received an “exceptional” score in categories including core experience, hospitality, friendliness, staff efficiency, catering, and cleanliness following a Quality Assurance visit. Developed over the last four decades in partnership with the tourism industry and informed by visitor research, VisitScotland’s Quality Assurance schemes are world-leading. QA stars alongside online reviews give visitors a balance of objective and subjective views to assist in their decision making and expectations. As well as achieving a five-star rating, Callendar House is also a member of VisitScotland’s Taste Our Best and VIP schemes. Launched in 2016, the innovative VIP programme, which boasts 11 ambassadors across the Falkirk area, harnesses the local knowledge, warmth and enthusiasm of partners across the country to help visitors receive the warmest of welcomes and make the most of their trip to Scotland. The initiative comes as a direct response to significant changes in visitor behaviour in the last five years, with people now using a variety of channels to access the information they need where they need it, whether it be online, on their phone or in person. The Taste Our Best award scheme – a joint intiative between VisitScotland and the Scottish Government, with support from Scotland Food and Drink – was designed to promote the use of Scottish produce within the tourism industry and recognise businesses that offer great quality Scottish food and drink experiences. Callendar House became a visitor attraction in 1996 after centuries as a family home. It sits in Callendar Park which also contains a section of the Antonine Wall World Heritage Site. The spectacular house boasts a working 19th century kitchen where costumed staff create an interactive experience for visitors and offer samples of early 1800s food as well as a museum which details the story of the house and area covering the 11th to 19th centuries. 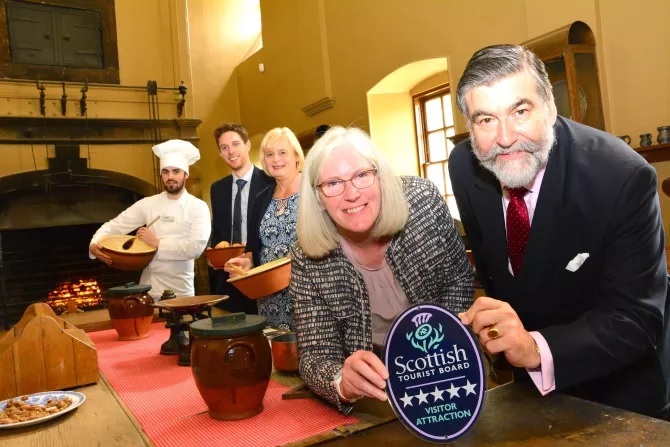 Lord Thurso, VisitScotland Chairman, said: “I am delighted that Callendar House has achieved a five-star Quality Assurance rating. This is a clear sign of Falkirk’s tourism offering going from strength to strength as it becomes the third five-star attraction in the area. “Callendar House is a key attraction to the town and this award is a testament to all of the hard work and dedication of the staff. Maureen Campbell, Chief Executive of Falkirk Community Trust, said: “The house is a credit to the local area and is a fantastic free day out. VisitScotland is Scotland’s national tourism organisation. Its core purpose is to maximise the economic benefit of tourism to Scotland. The organisation’s core objective is to contribute to the Tourism 2020 Strategy ambition of growing tourism revenues by £1 billion by 2020. This will be supported by five overarching strategies: Marketing, Events, Quality and Sustainability, Inclusive Tourism, International Engagement. The organisation employs 700 people and has offices and VisitScotland Information Centres across Scotland. Central to YoYP 2018 will be a celebratory events programme that puts young people at the heart of its development and delivery, creating new and valuable experiences for young Scots and the wider public, with links to the inaugural 2018 European Championships. Over 200 young people throughout Scotland are currently being recruited to become YoYP 2018 Ambassadors. Ambassadors will ensure that people and organisations in their communities know about what’s happening and will lead on projects and activities to create events and opportunities to celebrate young people. Equality and Discrimination – broadcasting the value of young Scots, challenging negative perceptions of young people, and supporting young people to take leading roles in challenging discrimination in all its forms. Culture – celebrating young people’s talent and contribution to Scottish culture and arts. Further information on what’s happening and how people can get involved can be found on the new website www.yoyp2018.scot or @YOYP2018 on Twitter. This entry was posted in Attractions, Food & Drinks, Tourism, Travel, Travel Awards, Travelers and tagged awards, Callendar House, drinks, Five-Star rating, hotels, Lord Thurso, Maureen Campbell, restaurant, VisitScotland, ‘Food. Bookmark the permalink. Visit TravelPRNews.com's profile on Pinterest.